A portion of the crowd attending the Dec. 6 meeting on the proposed new fairgrounds building. 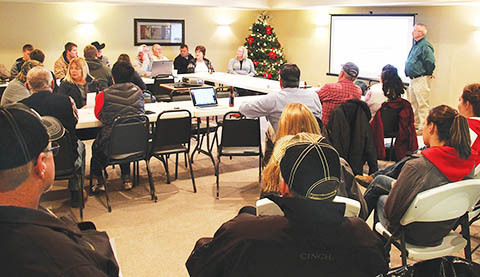 An estimated 60 to 70 Boone County residents were on hand Wednesday evening, Dec. 13, at the Albion Country Club for a discussion of the proposed new agriculture and education building at the Boone County Fairgrounds. The plans for this building are revised from the 2015 proposal, which was estimated at nearly $7 million. The newly proposed building, with a price of $4.25 million, has been under discussion since October, and the Boone County Commissioners have made a verbal commitment to financing. Plans displayed at the information meeting show a 150 x 300 foot steel building for a multi-use livestock arena, animal stalls and wash areas. On the north side of the building would be 70 x 150 foot structure that was not included in the 2015 proposal. It would be heated and cooled, and would house Extension offices, concessions, a conference room, restrooms and a 44 x 55 foot indoor storage area. There would also be a 25 x 55 foot open area covered by a roof but with no walls. As proposed, the building would be located on the south side of the present gravel road through the fairgrounds, east of the outdoor arena and south of the Casey building. The building would be required to meet current fire and energy codes. Commissioners have discussed an appropriation of $1.3 million from the county’s Inheritance Tax fund for this building, with the remaining $2.95 million to be financed either through general obligation county bonds over 10 years, or by a County Agricultural Society special building fund levy. Commissioner Ken Luettel said the county could pay a portion of the utility costs due to the Extension office being located there. This would free up space in the courthouse. At present, commissioners are meeting in the break room, and the Assessor’s office is very crowded. Luettel and Commissioner Hilary Maricle said advantages of having the Extension office in this new facility would be that people would be there five days a week to provide information and answer questions. Luettel said he has also suggested moving the economic development offices there. Read more in the Dec. 13 Albion News and Petersburg Press, Print and E-editions.